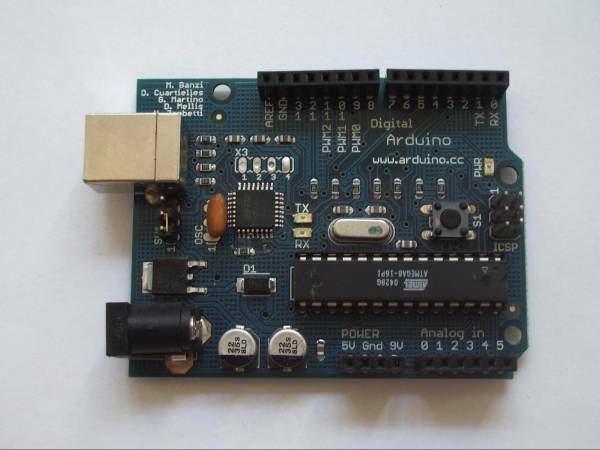 Arduino Boards were initially developped by researchers from the Interaction Design Institute Ivrea, Italia as an open source project for producing low-cost basic computers for electronic development called Single-Board Microcontroller. The first Official Model (Arduino Extreme) ran an ATmega8 microprocessor enabling serial RX TX Communication and easy programming of 6 analog and 12 digital Input Output Pins that enable for instance to read sensors signals or feed electronic circuits or transducers working with low power such as electronic LEDs. Simple but powerfull programming environments based on the C++ language were ued to control the behavior of the microcontroller. Today we can find world-wide hundreds of official and forked variations of Arduino Hardware that can be all easilly programmed with the Arduino programming software and that can be used with a variety of electronic standard components and dedicated plug-ins called shields to interface almost any type of existing peripheral. Most powerfull Arduino boards are based today on ARM processors found in smartphones and can handle a Linux or Android Environnment system just like a computer would do. This new concept of microcomputers have been developping since through other equivalent projects such as the Teensy, the Rasperry PI or else the BeaggleBone. Even the major industries producing processors and computers have launched their own development boards based on the Arduino phylosophy such as the Leonardo Board by Intel or the STM32 Nucleo by ST Microelectronics.